The hike to the Great Gallery, the most distant rock art panel, and back is about seven miles with a 600 foot vertical drop from the rim to the bottom of the canyon. It is not easy hiking as the bottom is almost entirely sand, making for slow and clumsy going. And the climb out of the canyon at the end of the day is tedious. The sun beating on the sandstone walls makes the bottom of the canyon quite warm. The small amount of water in the streambed is not potable so you must carry all your water; a minimum of two quarts per person is advisable, more in the summer. And, as we found out, if you don’t pay attention you can miss a site and walk right past it. The trail starts out on slickrock marked by cairns (small rock piles) following the original stock trail. In about a half mile you reach the remains of an old water tank and watering trough. A short distance before there is a single dinosaur track on the left edge of the trail. It’s circled with rocks to make it obvious. 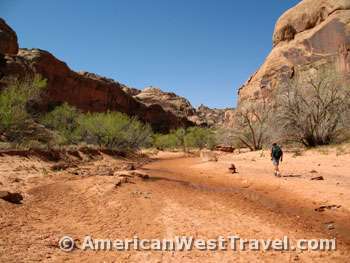 Soon you reach the very edge of the canyon and then hike down a large sand dune to the bottom of the canyon. From here, the hike proceeds south, or upstream. The canyon near the base of the sand dune is wide open, sandy, and bone dry. As you proceed upstream the canyon narrows with sheer walls on either side. (Photo, Above Right) Surface water appears in the stream bed. The canyon becomes more riparian with trees and other lush vegetation. The first rock art panel, the High Gallery, (Photo, Left) is on the east wall (your left) in this area. You cannot see it from the stream bed. Rather, look for a cairn on the left with a trail going into the brush. The High Gallery is so named because it is well above the ground, perhaps ten yards or more. The earthen bench beneath it probably collapsed and eroded away long ago. The small panel of perhaps twenty medium-sized figures is quite faded. A pair of binoculars would be quite helpful. The second panel, the Horseshoe Shelter Gallery (Photo, Right) is almost directly across the wash on the west wall. It’s in an open area so once you cross the wash and get out of the thicker vegetation it’s easy to spot. This panel is close to the ground and easier to observe. There are many smaller sized figures with a slightly different style than the other panels in the canyon. As the sandstone wall is lighter here the figures appear more brown than purple. It’s a good area to explore as there are numerous figures on the walls beyond the main panel. There are some petroglyphs (figures that are etched into the wall, rather than painted) mixed in but they are largely faded from recognition. The Great Gallery is another one and a quarter miles past the Alcove Gallery. We weren’t paying close enough attention apparently, missed the site, and walked a mile or more beyond it in a very hot and open section of canyon! After realizing the mistake and heading back, we readily found the site. The wash was rather wide in front of the Great Gallery, and we had been trudging through the brush on the east side of the wash while the panel was in an alcove on the west side. An easy way to get your bearings: a couple hundred yards beyond (south of) the Great Gallery, a foot trail comes in from the east rim. There is an obvious support structure just below the rim. If you spot it, you’ve hiked too far! Since the turn of the century, visitors have been fascinated by the magnificent rock art sites of Horseshoe Canyon, once known as Barrier Canyon. Barrier Canyon rock art is typified by large front-facing human figures. Most of the figures are colored a solid red by the mineral hematite and some are highly decorated with dots, spirals, wavy lines and animals. The figures usually lack arms or legs. Figures with arms often hold plants like wild grasses, or snakes. Dogs and birds are sometimes painted near the human figures. 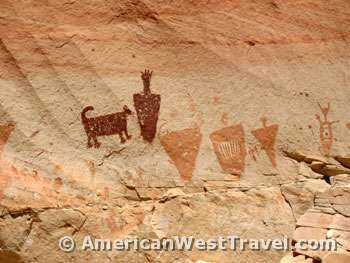 Barrier Canyon rock art was created by Archaic hunter gatherers during 1,000-2,000 B.C. Clay figurines found in Early Archaic archaeological sites resemble the long, tapering bodies and rounded shoulders of the rock art. However, the clay figures date several thousand years earlier. Split-twig figurines are also associated with Barrier Canyon rock art. What the figurines or the rock art mean remains a mystery. The base of the alcove is roped off so you cannot get up right next to the rock art. A couple of log benches are provided for contemplating the site. There are also metal boxes containing a pair of binoculars and a park service write-up discussing the rock art.